The Ram Rodeo Series and Tour® is a Nationwide Sheep Riding Competition that spans several provinces and encompasses qualifiers from a vast number of cities. The top qualifiers from the nationwide qualifiers, or “Sheep Series” are invited to the semi-finals, or “Ram Tour”, and only the best of the best from the Tour qualify for the National Finals. 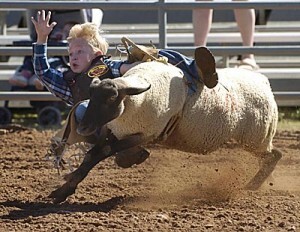 The Ram Rodeo Series and Tour® crowns annually both a National Finals Champion and a Canadian Champion Mutton Buster.